This dessert is perfect as an alternative to traditional Christmas pudding and it still has that wonderful 'wow' factor which is essential on Christmas Day. Make it ahead and keep it in the freezer for up to one month. Line a 1.5-litre pudding basin with clingfilm. Place the cherries and apricots in a small pan with the orange juice and simmer gently, stirring, until nearly all the liquid has evaporated. Leave to cool completely. Chop the chocolate-coated orange peel and nougat into small pieces. 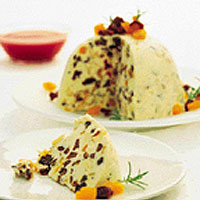 In a large bowl, beat together the mascarpone and sugar until smooth, then stir in the cherries, apricots, peel and nougat. Whip the cream until it just holds its shape, then fold into the mascarpone mixture. Spoon into the pudding basin and smooth the top. Cover with clingfilm and freeze for at least 4 hours, or until firm. To serve, transfer to the fridge for about 30 minutes to soften slightly, then turn out onto a serving plate and peel off the clingfilm. Decorate the bombe with a sprig of fresh rosemary or a couple of bay leaves and some chopped dried apricots. Cut into slices and serve with James White Apricot or Raspberry Coulis. Find the semi-dried fruit in the fruit and vegetable section. For a more adult dessert, replace the orange juice with alcohol, such as Calvados, Cointreau, marsala or sherry.